Being a Teen Titan isn’t so easy these days. Not only has their sweet Titans Tower HQ been destroyed, but the team is struggling under the leadership of Robin. Damian Wayne may be the son of Batman and a brilliant tactician, but his interpersonal skills are not strong. Now the Titans are at a crossroads — Robin wants to recruit new members, while the rest of the team want to give Kid Flash a second chance after he seemingly betrayed them to join Deathstroke. 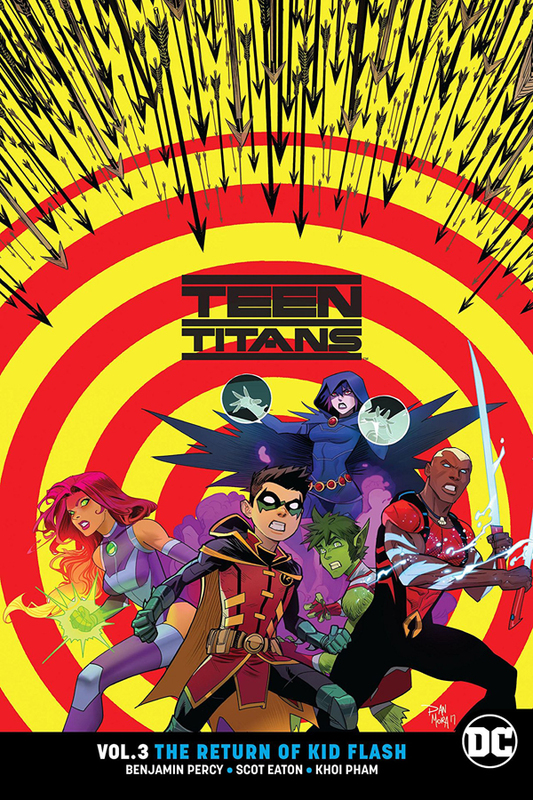 It’s all getting to be too serious for the one Teen Titan who just wants to have fun. But when Beast Boy leaves the team to join up with a bleeding-edge underground tech collective, he soon finds that sometimes fun can be deadly. Someone needs to save Beast Boy from himself… but in their current shape, the Teen Titans might not be up to the task! This collection from writer Benjamin Percy (Green Arrow) and artists Khoi Pham (X-Force) and Scot Eaton (Aquaman) also features a Starfire spotlight by her co-creator, Marv Wolfman (New Teen Titans)! Collects Teen Titans #13-14, #16-19 and a story from DC Holiday Special 2017.